Running any kind of business where cleanliness is paramount requires not just an effective vacuum cleaner, but the best commercial-grade vacuum cleaner you can find. Janitorial services depend on vacuums to help them keep carpets and kitchen spaces clean and free from dust, allergens, and debris. In the hospitality industry, clean carpets and drapes are essential to maintaining the highest standard of cleanliness for your guests before, during, and after their stay. Most critical of all, however, is the need for a high quality commercial vacuum in any food service location, both for maintaining the appearance of the premises and the health-code regulated cleanliness of the dining area. After all, no one wants to eat in a restaurant where there is clearly still food and debris left all over the floor. Choosing the best commercial vacuum cleaner can be significantly more difficult than running a vacuum cleaner, but it is no less essential to get the best possible value for your investment since a commercial vacuum cleaner is going to see heavy duty use seven days a week in most cases. 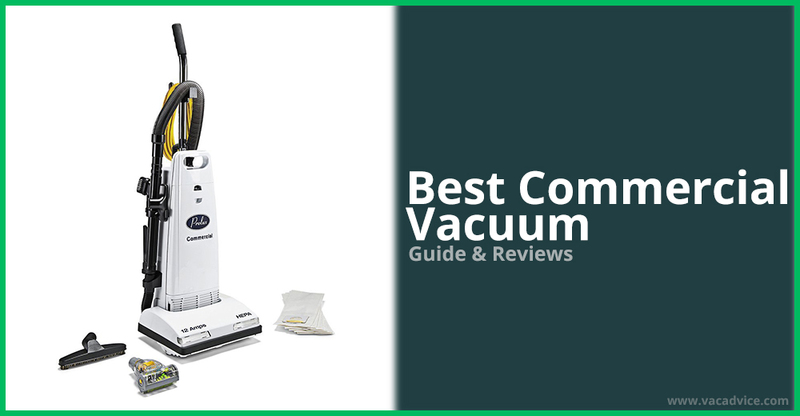 Check out the buyer’s guide below to help you choose the best commercial vacuum for your business, as well as our product reviews to help you ensure that you get the best commercial vacuum cleaner for your daily needs and your budget. This ultralight and portable commercial vacuum cleaner comes standard with a 40-foot power cord and and a top-fill disposable collection bag. Its powerful motor drives the high speed brushroll at anywhere from 5000-6500 RPM, ensuring that all dust and debris are speedily propelled into the collection bag for easy disposal. The brushroll also adjusts automatically for various floor heights from carpeting to hard surfaces, and the low profile design makes cleaning under and around furniture easy and convenient. Furthermore, the side edge brushes make cleaning along walls and baseboards both fast and efficient. A built in breaker system prevents damage in the event of clogs or jams, and the cogged V-belt is slippage resistant to keep your Oreck functioning perfectly even under heavy regular use. As best values for commercial vacuum cleaners go, Oreck definitely makes a strong contender for being one of the leading manufacturers in the industry, and their reputation among commercial vacuum users is outstanding. Best of all, this 9 pound wonder has one of the most comfortable ergonomically designed handles ever made for a vacuum cleaner, making long cleaning sessions easy on your wrist and elbows. When an upright vacuum won’t do for cleaning your location due to limited space or room to maneuver, Hoover offers this convenient shoulder carried canister vacuum that lets you move freely even when operating in close quarters or up and down stairs. The included telescoping wand has multiple attachments for cleaning every surface from floor to ceiling in your home or business, and the 33-foot cord means you have more room to roam if you need it. Possibly the most unique feature of this vacuum though is the included reusable cloth dust bag that can easily be washed and air dried after every use, reducing ecological waste and providing significant savings over the lifetime of your vacuum. You can use optional paper bags as well if that is more convenient for your needs, but the availability of a reusable option that reduces waste definitely adds unique versatility to the CH30000. For the ergonomically minded, ProTeam makes this convenient and powerful backpack vacuum that makes cleaning larger locations fast and convenient. 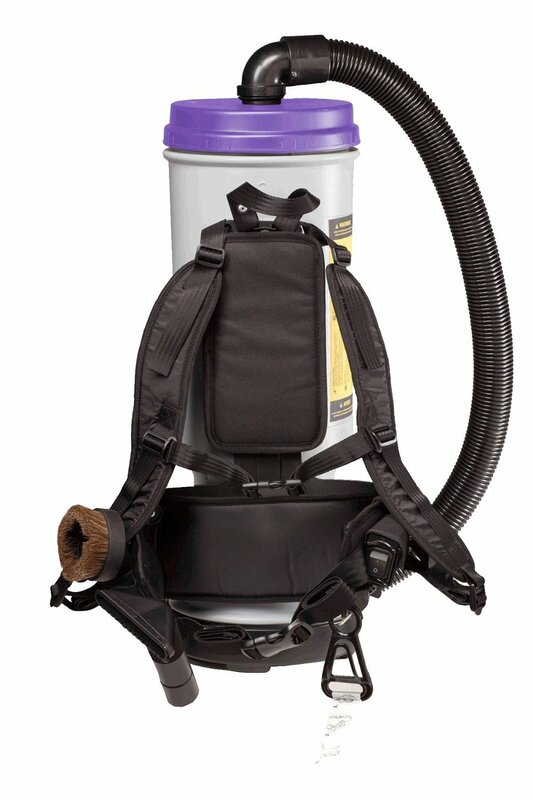 With its 10-quart capacity, this backpack unit can collect up to three times the amount of dust, dirt, and debris that a standard upright vacuum collects. The built in HEPA filter improves air quality by trapping the smallest of particles that often escape most other vacuums via the exhaust port, and the Super CoachVac also holds a Gold rating from the CRI. As if power and quality were not enough, the Super CoachVac is also one of the quietest operating vacuums available, generating only 66 dB of noise. Reach is also never a problem thanks to the included multi-attachment telescoping wand and 5-foot power cord, and the powerful motor and wide-gauge hose ensure that cleanup is fast and efficient. Overall, the Super CoachVac provides one of the best values and most comfortable cleaning experiences for a commercial vacuum currently available on the market today. Hoover’s lightweight backpack carried bagless vacuum makes small area cleanup in tight spaces a breeze thanks to its superior ergonomic design that was developed in conjunction with neck and back specialists. Clean for hours on end without experiencing the neck and backaches most often associated with frequent vacuum carrying or upright operation. In addition to being comfortable to carry for hours on end, this backpack unit is also one of the quietest models on the market, allowing you to clean without disrupting the environment around you or rendering the user incapable of hearing during operation. Additionally, this model includes 48-foot 3-wire power cord and a wide array of cleaning tools like a 6” crevice tool, an 11” high speed carpet/flooring tool, a dusting brush, and an upholstery cleaning tool. 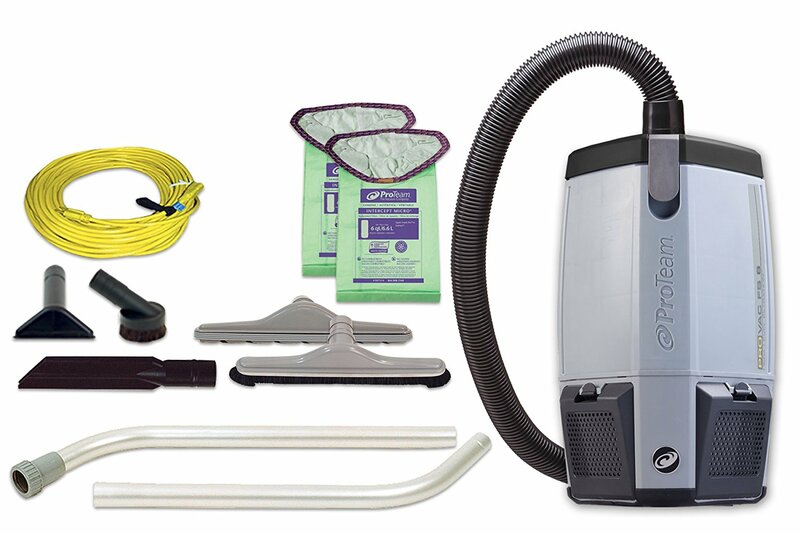 Whether you clean small offices all day or do frequent car detailing, this backpack vacuum is going to be your best value if you are looking for comfort, power, and convenience. Electrical cord may be somewhat cumbersome for users in smaller spaces. This lightweight upright commercial vacuum offers a powerful 5 amp motor and a large 18 quart collector capacity, allowing you to get more cleaning done with less downtime for emptying the canister or making multiple passes to pick up missed dirt and debris. The versatile vacuum head drops flat for easier cleaning under and around furniture, and overall 12 pound weight makes it easy to maneuver even in tight spaces. The brushroll can also be manually adjusted for different flooring heights, making carpeted or hard floor surfaces easy to clean. Additionally, the SC679J has both a HEPA filter and an ULPA (Ultra Low Penetration Air) filter to provide the best possible air quality after cleaning, ensuring that your workspace air is as dust and allergen free as possible. The collection bag is also a washable Tietex fabric that can easily be shaken out into the trash and reused again multiple times before requiring replacement. Best of all though, this vacuum has CRI approval for soil removal and post-cleaning indoor air quality, making it truly ideal for your commercial vacuum needs. For those in need of a versatile and powerful commercial vacuum cleaner, Prolux offers their 12-amp 6000 model. The floating head steel brush roll can deep clean any type of carpet with ease, and the integrated cleaning hose and accessories make cleaning upholstery or curtains fast and convenient. It even has a spinning brush roll hose attachment for removing pet hair and other debris from upholstery and drapery. The included wand is also extendable for accessing those hard to reach places up high and down low around the furniture and fixtures. Furthermore, the Prolux 6000 features a sealed motor bypass that prevents dust and debris from getting into the motor mechanism itself, keeping your vacuum operating and maximum efficiency for hours on end. Best of all though, this vacuum provides superior value thanks to unique features like a bag-full light and soft-touch wheels that won’t mark or damage hard floor surfaces. 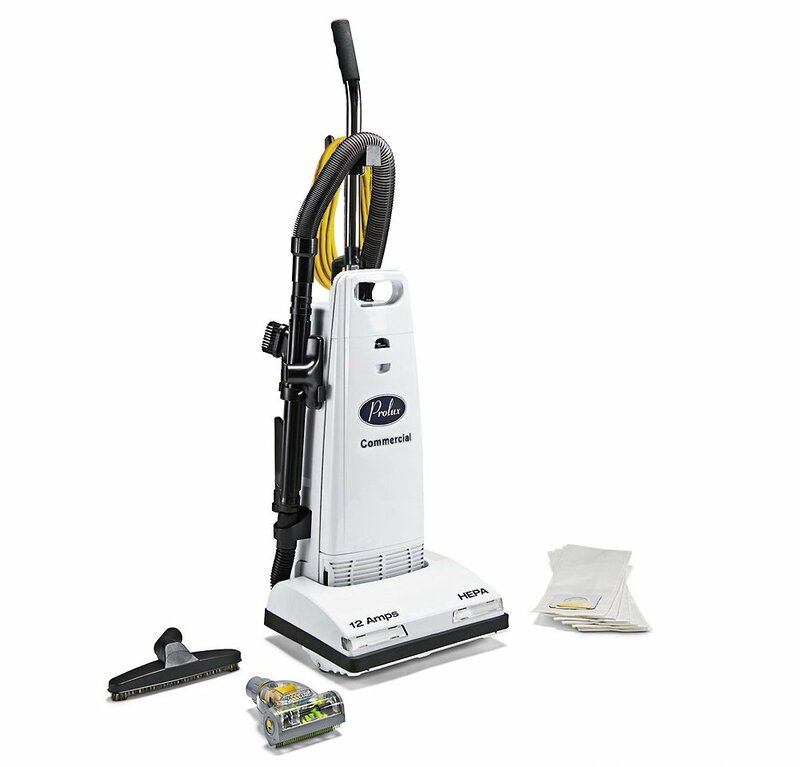 As one of the most powerful bagged vacuums commercially available, this offering from Hoover is an all-around all-star performer that is suitable for just about any size cleaning job. 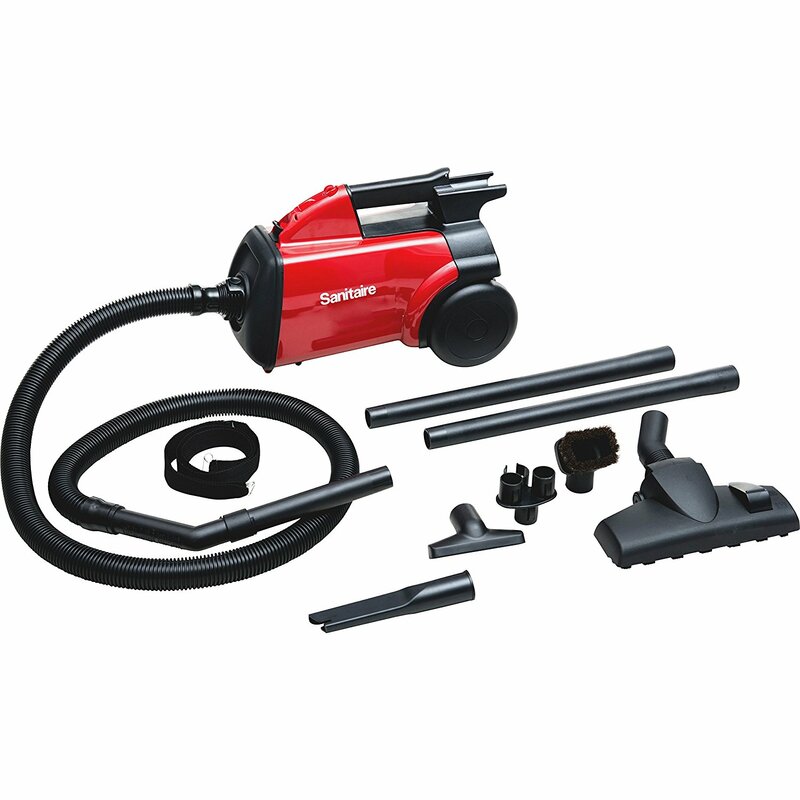 The unique WindTunnel technology creates three air channels around the brushroll, allowing this vacuum to collect up massive amounts of dirt, dust, and debris quickly and easily. The brushroll head also has five adjustable settings to tackle any flooring surface you throw at it, and the non-marking furniture guard protects the fixtures and furniture from being marked up or damaged by the normal use of this vacuum around a workspace. Additionally, the handle can be lowered almost parallel to the ground, making cleaning under those hard to reach spaces fare faster and easier than ever before. The high-quality urethane wheels also provide exceptional traction and prevent the marking up of hard floor surfaces even with multiple passes. 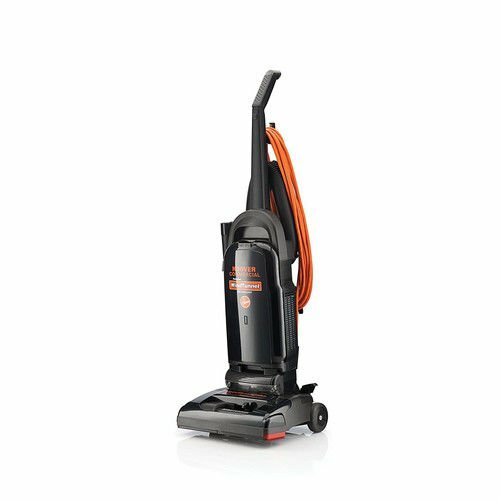 Overall, it is hard to find a vacuum that offers this much power and convenience in such a lightweight and compact package. For those in need of a compact canister model for convenience and portability, the Sanitaire SC3683B is an exceptional choice for commercial cleaning needs. The included wands allow you to extend the vacuums capability to reach both high and low areas of your business or cleaning locations, and the included accessories are ideal for cleaning both carpeting and hard floor surfaces. Furthermore, the quiet operation motor and small size mean this canister vacuum can easily be operated during normal business hours without unduly disruption of the work day if necessary. The designs is also bagless, which cuts back on the overall operating expense of the unit over its lifetime. The SC3683B is definitely a standout performer for cleaning stairs and smaller office spaces that are in routine need of additional attention. A lighter, more compact version of the Super CoachVac, this comfortable and powerful backpack vacuum features a 6-quart capacity and washable bags for increased versatility an eco-friendly operation. This particular model was designed with restaurants in mind, as it is smaller and easier to maneuver in tight spaces without a diminished capability for reaching under and around furniture. The numerou included attachments allow you to clean up just about any mess imaginable, and the extra long cord ensures that you won’t be interrupting your cleaning to find another outlet during extended cleaning sessions. Additionally, this vacuum has a 4-level HEPA filter that generates the highest possible air quality during operation, and the filter is washable to cut down on waste and additional operational costs. Best of all though, the free-airflow harness makes this vacuum extremely comfortable to operate even for extended periods of time, making nightly cleanup after closing less of an uncomfortable and physically taxing chore. 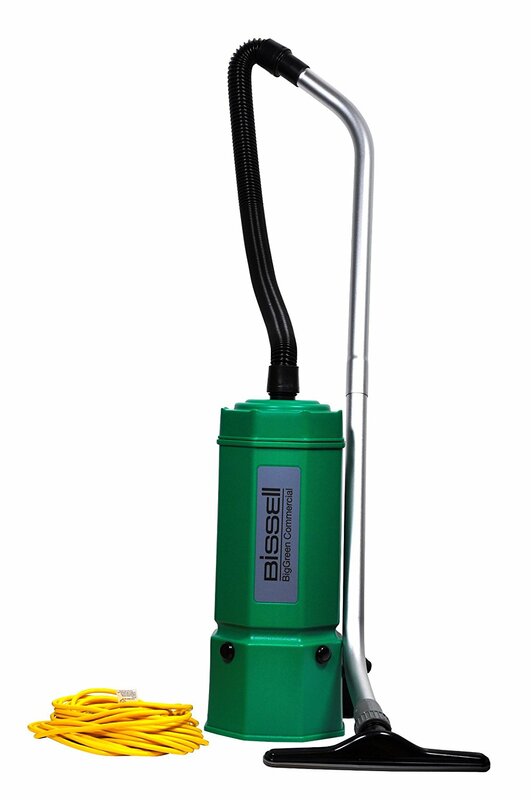 Nicknamed “Big Green” due to its colorful appearance, this powerful commercial backpack vacuum is definitely the cream of the crop in terms of quality and capability. The stainless steel wand telescopes for easy cleaning in hard to reach places both low and high, and the included accessory pack can handle virtually any cleaning task a vacuum might be implemented to handle. 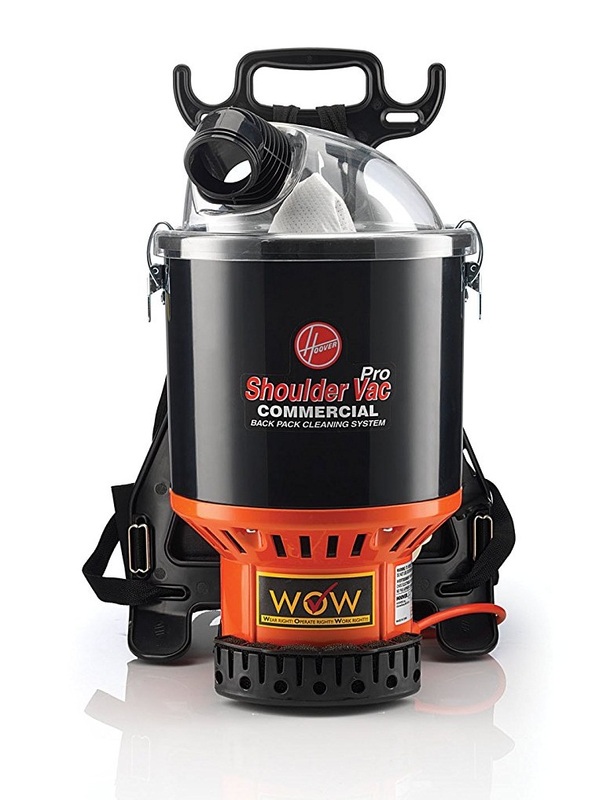 The powerful motor provides significantly more suction than many comparable backpack vacuums, and the 6-quart capacity ensures you won’t be pausing to empty the cannister very often. 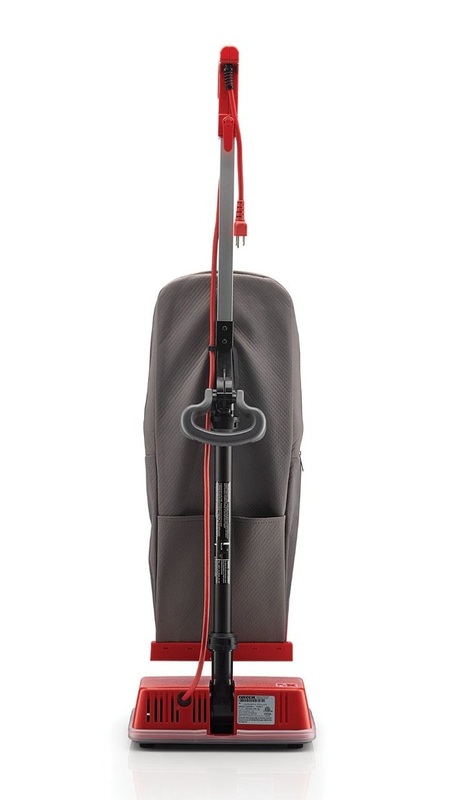 Moreover, at 9.5 pounds this is one of the lightest commercial backpack vacuums available, and extended cleaning sessions are no problem thanks to the extremely comfortable carrying harness and belt design. Whether your are dusting, cleaning the carpet or hardwood floor, or just tidying up in different spots, “Big Green” has you covered from start to finish. This model from Bissell is an exceptional value, and one of the top rated backpack commercial vacuums currently available for sale. HEPA not washable, must be periodically replaced to preserve air quality. Why choose a commercial vacuum cleaner? Commercial vacuums are built tough to be used every single day, typically with more powerful motors and suction than standard home use models. They also come standard with a longer commercial grade electrical cord, keeping your business compliant with most national and international commercial electrical codes. Bag vacuum or bagless vacuum? There are definitely advantages to both bagged and bagless vacuum cleaners, though bagless vacuums are always going to be more cost effective in the long run. The chief advantages that bagged collection canister vacuums offer over bagless is that dirt and dust stay in the bag when you are emptying them out, and they need their filters changed less frequently since the bag acts as an additional filter. Conversely, the bags tend to be somewhat expensive to replace, and they are not recyclable. Additionally, if your staff runs out of bags, the vacuum is all but useless until you can get a replacement. Bagless vacuum cleaners eliminate the cost of bags and the less eco-friendly waste of throwing vacuum bags away every time a bag has outlived its usefulness. The drawbacks are fairly simple as well: you have more filters to clean or replace on a fairly regular basis, and emptying the dust canister may cause problems for members of your staff that suffer from dust allergies or asthma. The important thing is that you understand the risk vs. reward with each type of vacuum when making a buying decision so it does not become a future headache that you have to resolve. What filtration system is best? Most commercial vacuums come with a certified HEPA (High Efficiency Particulate Arrestance) filter, which produces significantly cleaner air quality in the airflow exhaust produced by your vacuum cleaners normal function. If allergens or air quality are of high importance to your business, you definitely want to ensure that the commercial vacuum you buy has a washable HEPA filter system. Does the CRI certification mean anything? A certificate from the Carpet and Rug Institute means that the vacuum in question has been tested and found safe for thoroughly cleaning carpeting and rugs without causing damage to the flooring or floor coverings themselves. In other words, buying a CRI compliant machine means you are getting an industry approved vacuum that meets high standards of cleaning quality and function. What features should I look for in a high quality commercial vacuum cleaner? Hard floor options are a must for any business that has a significant amount of hard floor carpeting, laminate/hardwood, or tile floor surfaces to clean. The Homemakers Journal offers more insight on the vacuum for laminate floors. Most uprights can pull double duty, but there are a few canister vacuums that need special attachments to work effectively on hard floods. Edge cleaning is a priority if you do a significant amount of vacuuming around baseboards and walls in your establishment. Adjustable height settings for vacuum heads on canister vacuums and on upright vacuums allows your vacuum to pull double duty for hard floors and carpeting. Choose a vacuum with a variable control brushroll, as using a powered/motorized brushroll on a hard floor surface can actually scatter more dust and debris than it cleans up. Make sure the cord length is long enough for use within your premises or the premises where you will be cleaning most often. Most locations find a 40-foot cord to be more than adequate, but working in larger rooms with limited outlet access may require a longer 50-foot cord. There are rechargeable cordless options, but these tend to be more expensive than their corded counterparts. ​Our recommendation for the best value on a commercial vacuum for your business is definitely the Hoover C2401 Commercial Vacuum. Its ultralight backpack design makes it easy to cleanup after closing or during the day thanks to its powerful motor and quiet operation. Long term costs are likewise low thanks to its bagless design and easy-install HEPA filters, and you’d be hard pressed to find a vacuum that produces better air quality even unfiltered. 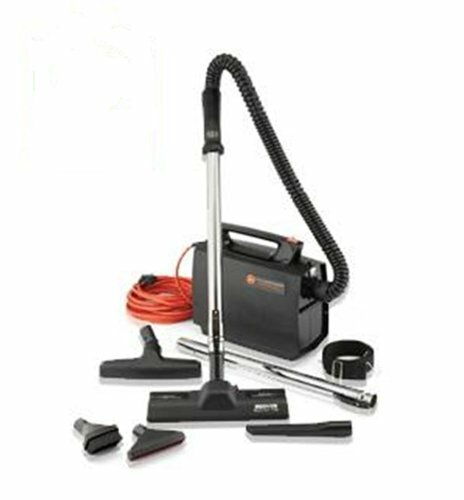 Definitely give the Hoover C2401 Commercial Vacuum a first look when you are shopping for your next commercial vacuum. It is definitely worth checking out.